Saxophone Art Print – Need a unique and whimsical gift thatÆs perfectly aligned with their passion? HereÆs a cool product that will instantly bring a smile to their face! With 8 ôRules to Work Byö, this is a fun read and the ideal room decor for home or office. 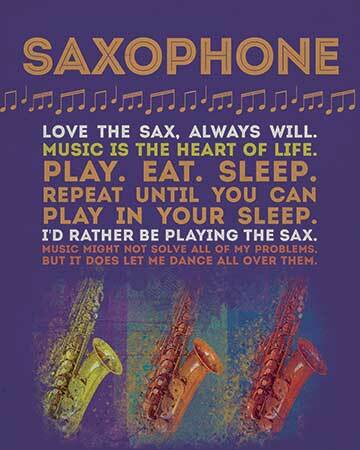 It features a vibrant graphic with witty sayings and quips related to playing the saxophone. Printed on thick, satin card stock, this unique print comes ready to be mounted with the frame of your choosing (frame not included). Size 8ö X 10ö. Cellophane wrapped for gift giving. Music Gifts for Saxophone Players!